For online registration, extra $1.00. Please note that registration will not be complete unless full payment is received. 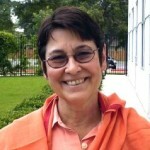 Pravrajika Brahmaprana is the resident minister at the Ramakrishna Vedanta Society of North Texas. Click here to know more about her.